I have a super easy one for you this week! 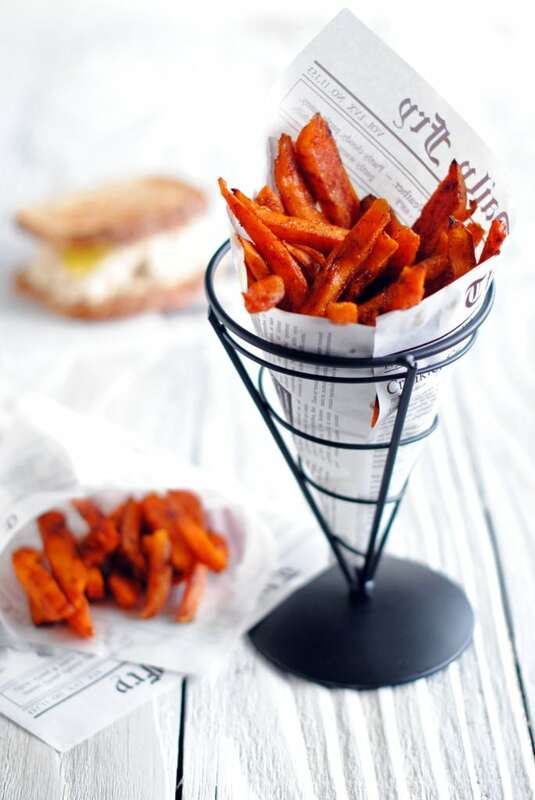 Baked Sweet Potato Fries! I love French fries, I really do. I can probably stick them on my list of food weaknesses. Ice cream and doughnuts are also on that list. I have some pretty strong will power, I do, but stick an old-fashioned chocolate iced doughnut in my face and that will power is nowhere to be found. Lucky for me I found a way to combat that pesky doughnut craving, I just stay away from the doughnut shop. Problem solved. But then there are French fries……man I love potatoes, baked, fried scalloped, mashed I will take them any way I can get them. My step-dad used to tease me and my mom (she loves potatoes too) that we must have some German in our blood. But as delicious as they are, too many potatoes can wreak havoc on my waist line so I have found a healthier alternative to feed my French fry craving. In come the sweet potatoes! These bad (but good) boys are loaded with flavor, beta-carotene and fiber. So go ahead and get your fry-fix on! And don’t forget to use organic ingredients when possible! Follow The Cake Chica on social media: Facebook, Instagram, Pinterest, and Twitter. Heat your oven to 400 degrees. Whisk together oils, cinnamon, cayenne pepper and brown sugar and set aside. Place potato strips on a foil lined pan in an even layer and pour oil mixture on top and toss to coat. Sprinkle with salt. 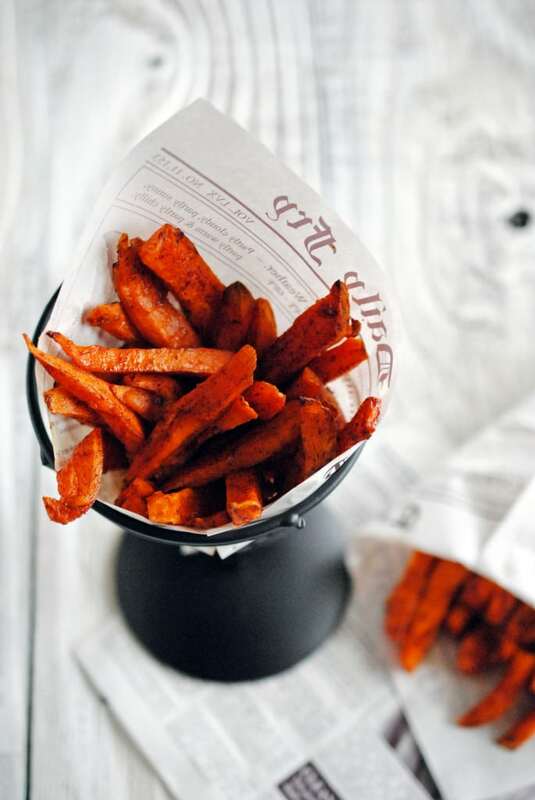 Place fries in the oven and bake for 10 minutes. Flip the potatoes and raise the oven temperature to 425 degrees. While the oven comes to temperature continue to bake the fries in the oven for 10 more minutes and flip again. Let bake another 10 minutes or just until they start to darken in color. Serve with organic ketchup or ketchup of your choice. 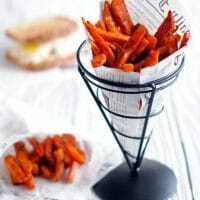 I love sweet potato fries! They are definitely one of my weaknesses (fries in general really are) – but I can never get them right when trying to bake at home! 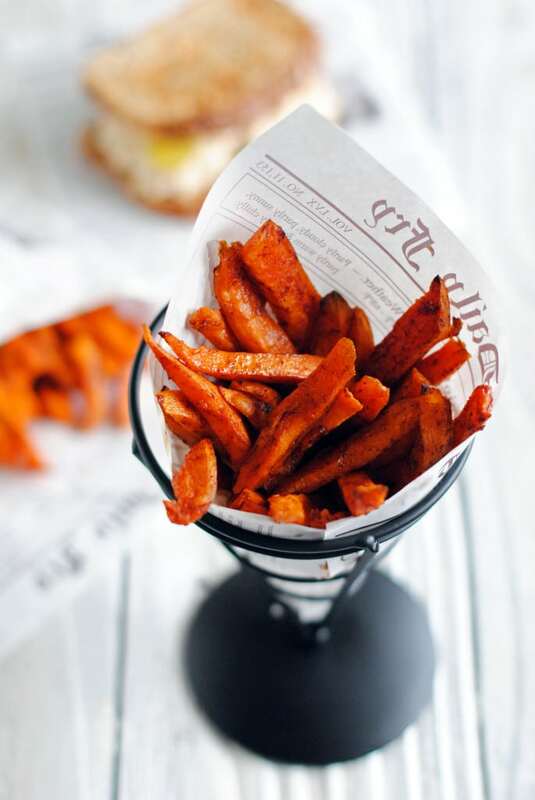 This method sounds great and the fries look perfectly crispy – going to attempt them again using this recipe! Thanks for stopping by! If you like them super crispy try reducing the oil a bit.